Santa Cruz shocksters get the Midas touch. 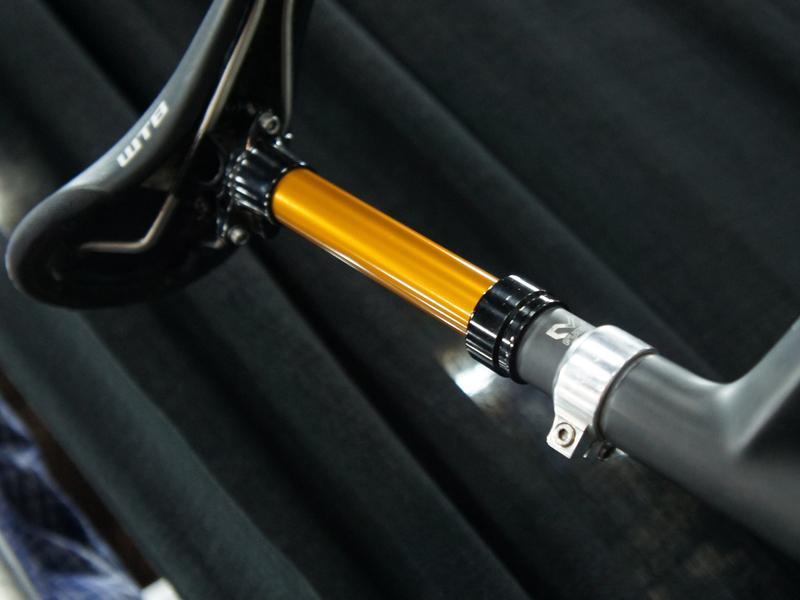 While we’ve been seeing prototypes for over a year now, X Fusion are finally nearing production for their flagship Revel HLR USD suspension fork. 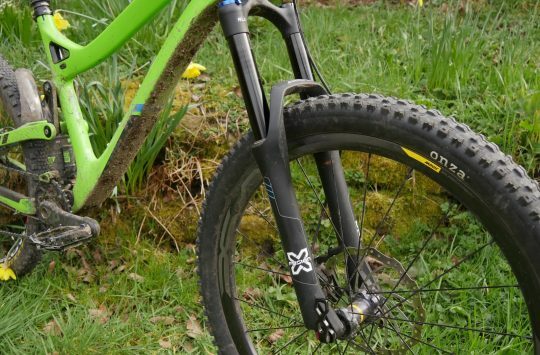 Using what the company calls Gold-E-Locks (three keyways in which cylindrical keys float) in each leg and a 20mm thru axle, X Fusion believe that they’ve addressed the bane of inverted forks: poor torsional stiffness. With that sorted, they’re free to reap the benefits of the layout: low unsprung weight, excellent seal lubrication, and the ability to hold the legs at their largest diameter. Limited production = machined crown. Designed to work with 27.5 (at 140, 150, or 160mm travel) and 29in (140mm travel only) wheels, the Revel moves some of its offset into the crown. On the bike, it can look as though the fork is bent forward, but the change better aligns the fork’s stroke with impact direction. 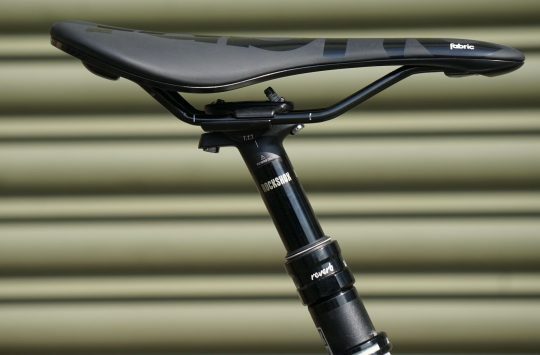 Internal testing suggests that, despite using 34mm stanchions, the 4.5lb fork is stiffer than Fox’s monster 36 series. A secondary air spring provides tunable bottom-out resistance and – in keeping with X Fusion’s philosophy – everything that can be made of metal is. Because they really don’t want to see purchasers running ugly disc adapters, the fork ships with size-specific disc mounts. 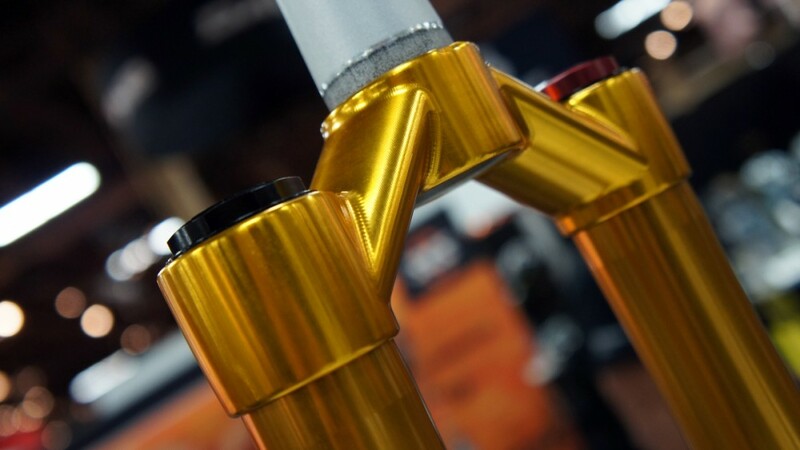 Composite stanchion guards mount solidly to the lowers and should help keep that pretty Gold Slick Ano finish in good condition. Representitive of the labour involved and the fact that the Revel HLR USD is X Fusion’s first US-made product, pricing has been set at $1,776 (the year of US independence)- plus $124 for an optional lifetime service program. Want one? Better hurry: only 200 will be built each year. But where is the cable? 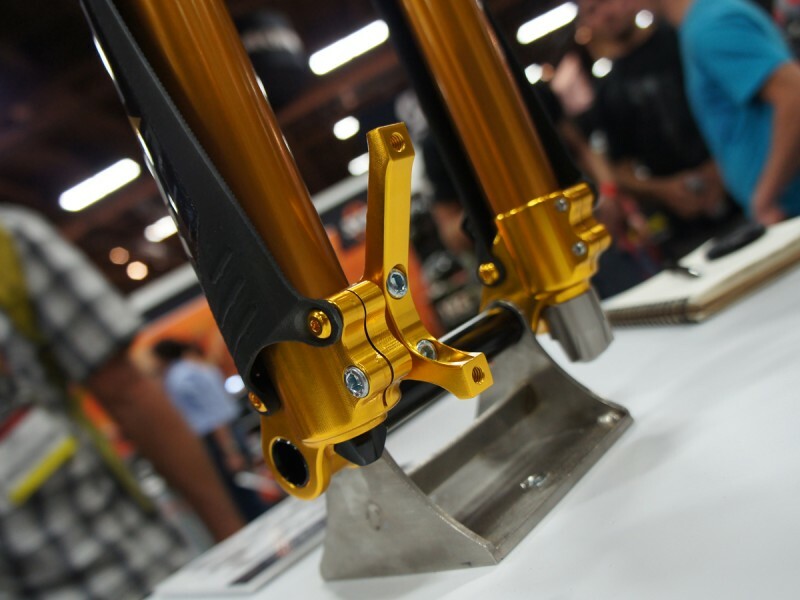 Deeper into the X Fusion booth, we found a prototype Hilo dropper post with a Gold Slick Ano shaft and internal cable routing. It’s not looking like a 2014 product, but may be a sign of things to come. Very nice! As lustworthy as the original Manitous. And about as much chance of me affording them. 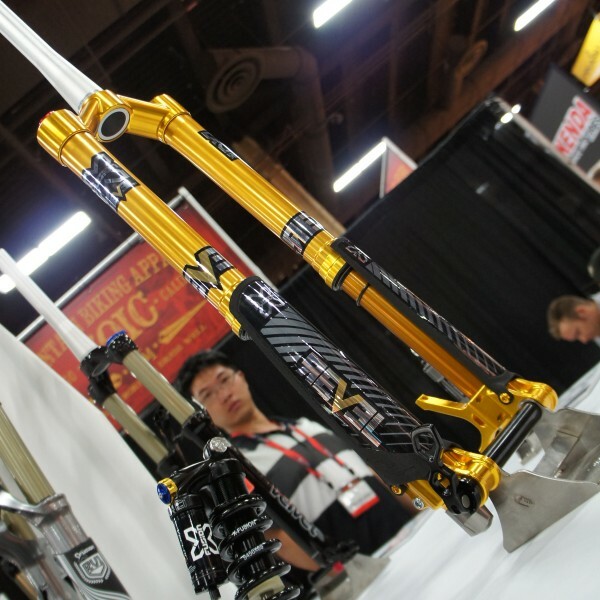 Reminds me of a pair of Rock Shox Mag21 SL Ti forks…..
Looks like its about to morph into a Transformer. Although, seriously they look like updated Maverick SC32s. I thought they looked like Maverick SC32s as well. How bling would the rest of your bike need to be to keep up with those? That fork’s rather yummy. Hope my Slant (when it eventually arrives) looks even half that good. 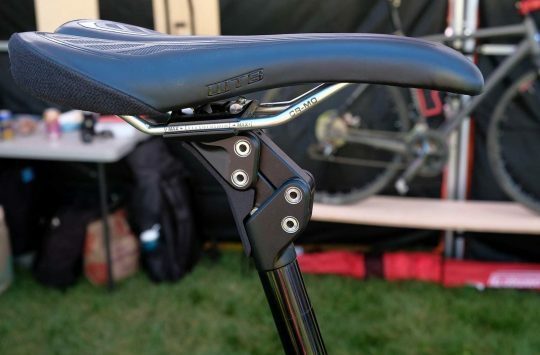 Don’t really get the Maverick comments though – of course it looks a bit like one – it’s a USD fork with lower leg protectors on it. 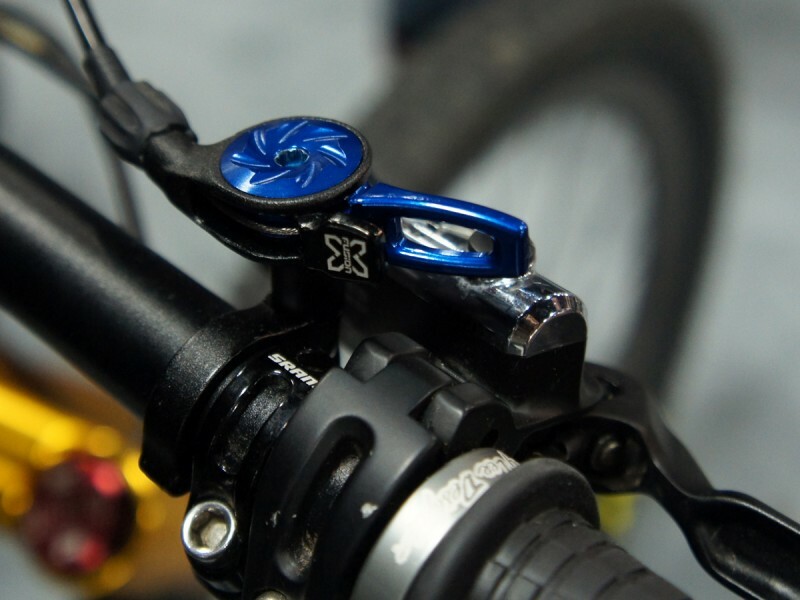 It’s a bit like saying Rockshox look like Fox because they both have lower sliders…. Being a fan of Mavericks I like the idea of these giving that they are bolt thru unlike mavericks cheese clamps. perhaps the resemblance has something to do with paul turner doing design work for them? Let’s hope the next project is a frame. That should be an update Maverick……. Though I find it hard to believe it could be made better.